This is a mod I'm am creating on the fly. 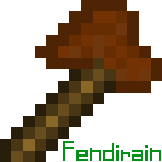 I have many ideas planned for it, Starting with, but not limited too, The Fendinain, Fenderium, and Fenderium Axe. Everything is WIP (including this post), and may be removed / changed at any time. 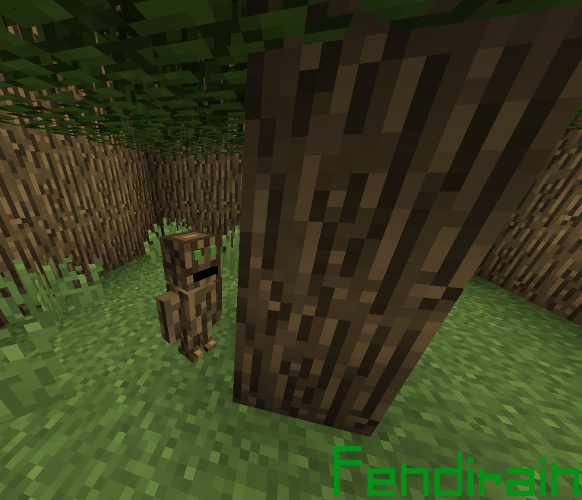 The Fendinain is partially inspired by the Grove Sprites mod. Warning- My java experience is limited, and so I am learning new things while I am making this mod. Don't be surprised if the mod is slow to update. All sounds, textures, models, etc are temporary. Spawns only during chunk generation, Semi rare; Does not re-spawn; and will only spawn in biome's with trees. Will spawn with 12 saplings relevant to the biome. They will drop whatever saplings they have on them if killed. Collects saplings on the ground & plants them. You could help them along and give them some as well (Right click with saplings in hand, It will take as much as it can). They will hold the next sapling they are going to place in their hand. They will occasionally attempt to plant the saplings they are carrying. If carrying different types, they will randomly pick one. Compatible with other mods saplings. Spawns only during chunk generation, Rare; Does not re-spawn; and will only spawn in biome's with trees. Will fully chop down any tree type (Compatible with mods that add new tree types). FendiOre: // Ignore - Currently disabled & Might be removed. Currently useless, But I have future plans for it. It generates rarely. Can chop down a whole tree from a single log, breaking the furthest logs first. By holding down the secondary mouse button while pointing at a log and letting it fully charge, you can chop the whole tree down at once (or as much as the durability allows). Uses x4 the durability. Fendi Piece: // Ignore - Currently disabled & Might be removed. Can be used to craft Fendi (Block), otherwise currently useless, But I have future plans for it. Fendi: // Ignore - Currently disabled & Might be removed. Currently useless, But i have future plans for it. Can be crafted with Fendi Piece's shaped like you would craft a chest. If right clicked with Fendi Piece, It will take it for future purposes (Up to a max of 8). Cannot be gotten back. May change, Wouldn't recommend doing it. Source Code is found on Github. Renamed ItemFendi to ItemFendiPiece (in code, It was already changed ingame). Now holds the next sapling it is going to place in its hand. Fixed panic speed (Was much to slow previously). Known Bug- Arm stays held out after running out of saplings to hold. BlockFendi now has a recipe (8 FendiPiece in a crafting table with the center empty). You can now right click to add FendiPiece into it (Up to a max of 8), currently does nothing/shows nothing. Planning on changing item it accepts. Now begs players for saplings if they are holding them. If the player puts them away, They will run away from the player. When spawning with saplings, they will now have a chance for different saplings in biomes with multiple types of trees. Amount of saplings they start with is now random (1 - 12). BlockFendi is now rendered in inventory/hand/on ground. Rework all sounds (If anyone wants to help in this area, Please Message). Maybe- Place things other than saplings (Randomly apply a small area effect of bonemeal?). Tons of other things that I need to flesh out (I have huge plans). Sorry for the lack of an update recently, I was taking a temporary break to work on another (Non-Minecraft) project. Not sure if I will be going that direction, But ideas may change. I'm curious as to how you find this mod? As I haven't updating anything but Github in a long time and figured it was to buried to be found. I'm not too hyped about mods adding random ores, but I'm looking forward to someone taking up grove sprites. If this goes in the right direction, I will definitely give it a try. The ore is for a future idea (Assuming I still head that direction). For now, I will commit it out as it's unnecessary. Yes, This is still alive, Sorry for the lack of response. To be honest, I wasn't expecting anyone to see this to need to bother checking often. And I hoped I might get something like this at some point. I may work on something like that soon, as I like some of those ideas, and wouldn't mind having something like grove sprites. I have a completely different direction for this mod, and am slowly growing my skill-set to be able to do it.